As I’ve said and will say over and over again, it’s easy to do something dramatic, but to make people – let alone lots of people – laugh is far harder. Some comedies, however, manage to be timeless. Let’s see if Bachelor Mother is up to the challenge. Set over Christmas Eve to New Year’s Day, Bachelor Mother deals with that favorite of comedies, the mistaken identity ploy. Polly Parrish (Ginger Rogers) is a single gal working at a huge department store that isn’t named Macy’s (it’s named Merlin’s) but is probably based on Macy’s. Christmas Eve comes with the goodbye letter – seasonal employees are done at the end of the day and Polly’s a seasonal employee with no one to turn to but her own spunky self. Merlin’s is a father and son affair – the father, John (Charles Coburn) is worried that the son, David (David Niven), is running himself ragged and not settling down. David is your typical rich man about town. Midday, Polly goes to the employment agency, and on her way back to Merlin’s she sees an older woman leaving a baby on the foundling home doorstep. She tries to talk this woman out of leaving the baby, but said woman tells Polly that she isn’t the mother and that there is no mother and that the foundling home will take good care of the baby. Polly thinks the baby is going to roll down the steps, so she goes and picks said baby up…right as the door opens. She’s ushered in and, naturally, nothing she says can convince the people working there that she is not, in fact, this child’s mother. Polly’s given them just enough information, so that the head of the agency (Ernest Truex) goes to Merlin’s to share the sad situation. He tells the tale of woe to David, who agrees to give Polly back her job, with a raise. Then he shares that Polly will get a “Christmas present” later that evening. One of the stock clerks, Freddie Miller (Frank Albertson), invites Polly to a dance off – they’re fixed to win second place and a $50 prize, which they can split. Of course, Polly goes home to discover that her present is the baby, putting a crimp in the dance contest plans. Polly – who knows that David Merlin got her into this, but doesn’t realize, yet, that no one believes the child isn’t hers – has Freddie swing by the Merlin household so she can drop the baby off, which she does. And hilarity ensues. By the end of the night, everyone believes that the baby is Polly’s. When her kind landlady, Mrs. Weiss (Ferike Boros) asks the baby’s name, Polly comes up with Joan. “Ah, John,” says Mrs. Weiss approvingly in her Old Country accent. David, meanwhile, is taking an interest in Polly and the baby, and soon Freddie believes that David is, in fact, the father of the baby. Meanwhile, Polly’s told David that her “husband” beat her, which is why she’s not with him and so forth. In Polly’s defense, she’s forced to lie, because no one believes her when she’s telling the truth. David’s father finds out what’s going on, sort of, and gets involved, and soon, what Polly originally wanted looks like it might happen – someone could take Baby John from her. But he’s her son now, and she’s not going to give him up without a fight. Does David ultimately realize he’s in love with Polly and the idea of the ready-made family and does this movie end with everything all worked out? What do you think? Screwball comedies have a formula, and a happily ever after is part of that formula. I expected to find Bachelor Mother offensive or boring. Instead, I loved it. So much so, that I forced the hubs to watch it, so I could watch it again, and he liked it. In fact, he probably laughed more than I did, and I laughed a lot. The movie works in no small part due to the charm of the leads. 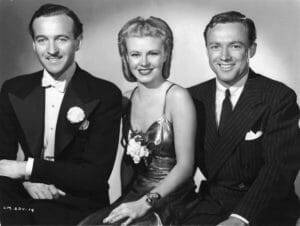 David Niven is at his most charmingly adorable, and Ginger Rogers is great. The supporting cast is good, too, and while he’s no Fred Astaire, Frank Albertson made a great dance partner for Rogers. One of the movie’s best points is that you get to hear all the dialog. In some screwball comedies (looking at you, Topper and His Girl Friday) the patter is so rat-a-tat that you miss lines, even on repeated viewings. Bachelor Mother doesn’t make this mistake – it’s not slow, but you actually get to hear what’s being said and so don’t miss the jokes or plot twists. 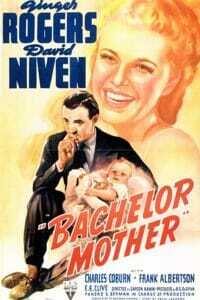 Bachelor Mother is a great example of the screwball comedy and is also a movie that deserves to be a Christmas Classic. If you’re a fan of either genre, this is a movie that shouldn’t be missed. I’m glad I took the chance on it – like Baby John, it’s a keeper. And, in keeping with the spirit – it’s also on my Christmas list.